With the Kentucky Fried Pixels bundle live now, and new players coming to our game, we are happy to keep the updates coming with Carkour! v4.0.2. This is a small update, but brings some nice UI and performance updates! 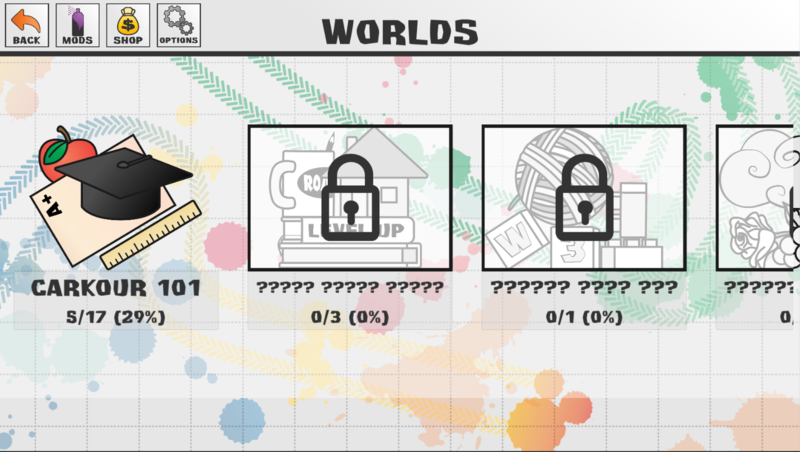 The World Selection menu now has icons per World with unlocked and locked modes. You can see a colorful image when you have unlocked a world, and hidden behind the locks, you'll see a gray preview of the world to come. The upcoming world names are also masked now until you unlock them, to leave a little reward for finishing the previous world. The Level Selection Menu has even better UI for the cards! Last update we enhanced the cards info and look. This update we took it even further and now those "Completed" indicators are crisp and bright. We also removed a rogue object that was causing the card details to get washed out. The home menu has always been kind of dull. We had recently updated it to be more colorful, but it was still kind of empty. 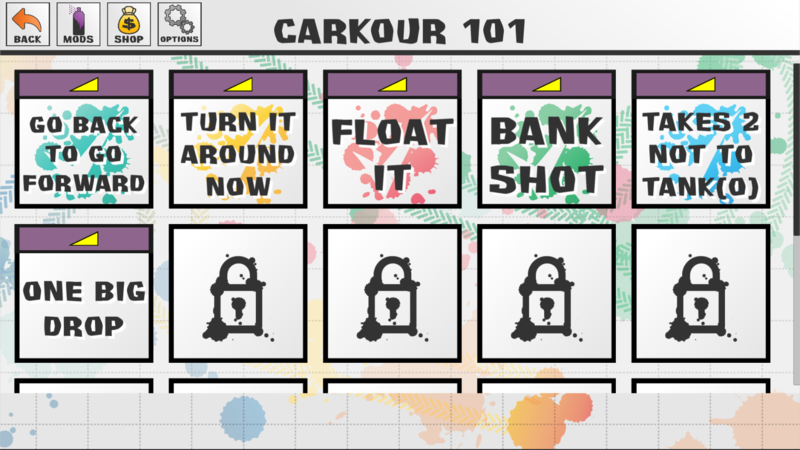 Not to mention that the title was till "Cool Carkour" and not the new, straight to the point: "Carkour!" With this update, we updated the title, and tried to make the screen feel more 'full', as well as spruce up how fun watching the car is. We hope you like it! Tweaked World 1 Level # ? The way our car spits out its trail of splats, we really were not very wary of your GPU/CPU. We were just dropping those things out as fast as we could, all over the place. With this update, the rate at which the splats are produced is tied to the velocity of the car. The resulting effect is really that splats appear more consistent, AND we are producing far fewer splats to render per second. Just to be sure, we also clean them up faster, so that if you are taking several attempts at a level, the splats shouldn't be able to bog down your device nearly as much. This is really only and issue for mobile devices, but we know that's a big platform for us, so this is a huge win on our side.